The last week in October was probably the most important, hectic week so far in our diplomatic career. During this time, India held its 3rd Africa India summit and hosted about 54 African nations in an effort to boost ties between the continent of Africa and India. In the biggest event since 1983, 42 African presidents attended this grand summit . We had a unique opportunity to host the President of Mali, H.E. Ibrahim Boubacar Keita, the First Lady of Mali, H.E. Madame KEITA Aminata Maiga, a delegation of six Malian ministers and 15+ government staff. What a nail biting yet amazing experience!! During the weeklong event, Mali had an opportunity to share with India the many ways that we can grow a mutually beneficial relationship with India. The Foreign Minister H.E Abdoulaye DIOP extended his gratitude for the military support provided by India while encouraging India to further strengthen its cooperation in the area of ​​peace, security and the fight against terrorism. The Indian PM Narendra Modi announced a 10 billion USD line of credit, aid amounting to 600 million USD over the next 5 years which includes a India-Africa Development Fund of 100 million U.S. dollars and an India-Africa Health Fund of 10 million U.S. dollars and 50000 scholarships for African students over the next 5 years. In his address, our President, His Excellency Mr. Ibrahim Boubacar Keita first paid tribute to the longstanding friendship and cooperation between India and Africa that were strengthened by leaders like Gandhi, Presidents Gamal Abdel Nasser, Nkrumah, Modibo Keita, Nelson Mandela and Jomo Kenyatta. He denounced terrorism and violent extremism, which according to him, is now one of the most serious threats to peace and security and noted that the fight against these evils must be at the center of the joint action of the Partnership. He stressed the potential of both parties and called for a strengthening of the strategic partnership for economic and social development of India and African countries. He also took the opportunity to express its deep gratitude and that of the people and Government of Mali to all countries friendly to the multifaceted and ongoing support to Mali. During his meeting with the Prime Minister of India, H.E President Keita expressed his gratitude to India for providing Mali with soldiers to protect the North of Mali. Our President also expressed interest in growing Indian investment opportunities in the fields of agriculture and technology in Mali. PM Modi further invited President Keita back for a separate bilateral visit to India. President Keita also took an opportunity to meet with the Malian student leaders from Bangalore. He expressed his support for them and his joy in meeting them. The last night, our delegation was received by a big Indian delegation that introduced us to the mystery of Bollywood and the true Indian culture. The night was filled with great music and good Indian food. This experience left quite a indelible unforgettable mark among all our delegation. This summit was monumental in terms of the endless possibilities to grow Mali and India’s friendship. Yeah and I gained a fresh perspective on how we can move Mali forward in our role. We learned so much more about diplomacy and had a chance to experience it truly at work. What an unforgettable, mind blowing experience all round! Since 1956, the village of Ferekoroba, Mali has seen only two of its daughters attain college degrees. Since 1956, the village has had many of its boys and many more of its girls drop out of school after 6th grade. In fact, Ferekoroba is one of the many villages whose inhabitants contribute to Mali’s disastrous 31% literacy rate. More than 1500 people flocked to the village of Ferekoroba to celebrate its big day. On April 19th, 2014, the village of Ferekoroba witnessed two firsts. On one hand, they witnessed their first and only middle school in the village made possible through a kind donation from the foundation Building Youth Around the World, the Empower Mali foundation and the Mayor’s office of Ouélessébougou ( who donated the village’s portion). On the other hand, for the first time in the village’s history, a minister from the government stepped foot on Ferekoroba soil. This joyous inauguration was attended by the Minister of Education, Madame Togola Jacqueline Marie NANA and her delegation consisting of the school authorities of the region, the local school authorities and her cabinet chief. This was a big day for the village of Ferekoroba as they witnessed their dreams for their future solidified through this new middle school. The village currently only has a primary school initially built in 1956 to which classes were added in 1976 by Peace Corp. So no new educational structure was added in the last 38 years. Currently, to attend middle school, many children will walk 3-7 km along dusty, unpaved roads to neighboring villages of Seguessona, Ouelessebougou and Tamala. The event was also attended by two members of the Building Youth Around the World foundation who had donated $50,000 towards construction of a fully equipped 3-classroom middle school, office block and 6 latrines. Executive Director Ian McCracken and his son Braedon traveled all the way to Mali from Utah to help dedicate this school to their chosen village of Ferekoroba. This middle school falls in line with BYAW’s mission to help strengthen opportunities for disadvantaged youth all around the globe. We are blessed that BYAW would choose Mali to help bring education to our children here. While they were here, Ian and Braedon McCracken also donated backpacks with school supplies to each middle school child and also solar lamps to the Chief of the village, his second in command and the School Director. The Minister of Education and her delegation was so impressed with the quality of the school and the spaciousness of the classrooms as well as the equipment within. In addition, the classrooms were cooler allowing for relief for the students from the hot Malian sun. Currently the government of Mali builds schools for a lot more money and they are more cramped and don’t last long falling into disrepair. The Minister stated that Empower Mali was a great partner to the Ministry of Education in Mali. She expressed hope that Empower Mali would continue to work to make education a reality for all, boys and girls and also expressed great interest in continuing to support our work in Mali. The role Empower Mali plays in education in Mali is unique. When we build our schools, they are self sustainable. By getting the village to pay towards the school with land, labor and a portion of the costs, the village is making a commitment. When you give a hand out, the impact is lost. In addition, our close ties with the Ministry of Education allows us to equip our schools with teachers paid for by the government. There are many NGOs that will build schools in Mali, but then those buildings sit empty because there are no teachers present to teach in the villages. Our approach is unique and our goal is to empower our villages to lift themselves out of poverty. Since 2004, Yeah has helped bring 19 schools to Mali. Not a small number. 19 communities whose lives have improved and will continue to improve for generations to come because of one man’s commitment to making access to education a reality for all children in Mali. In Mali, education is a gift and access to education is something we are fighting for , so all our children may have an opportunity to lift themselves out of poverty. This school will help the village of Ferekoroba break the cycle of poverty and illiteracy that has become commonplace. This beautiful 3-classroom school has become the hope of the children of Ferekoroba, especially our girls. This beautiful sign is on the main road. When Yeah first took office as Mayor in 2009, the city of Ouelessebougou,made of its more than 44000 members, were frustrated with their local government. In fact they were so frustrated that they had stopped paying taxes. In many cases, the money that had been paid in taxes was abused by the then Mayor to build houses and buy cars. The result was a growing discontent with the Mayor’s office and a failing city that was as non-progressive as the whole country. Furthermore, since there was no tax money, that meant teachers at schools and the staff at the Mayor’s office could not get paid and in many cases this led to the heightened corruption among city officials so they could support their families. When Yeah took office, he ran and was elected on a promise to root out the corruption that was plaguing the city. In June 2009, less than 10% of people were paying their taxes and Ouelessebougou was the 699th out of 703 cities in terms of development. Through gradually displaying to people that taxes linked directly to better services, Yeah was able to encourage the people of Ouelessebougou to begin and continue paying their taxes. Since then, the collected tax money has allowed employees at the Mayors office to be paid on time, paid for repairs on schools in the area, provided school supplies, helped build better facilities in many villages and encouraged a general good will towards Ouelessebougou from many businesses and NGOs. Many NGOs and businesses are knocking on Ouelessebougou’s doors seeing the success, transparency and ease of doing business. By 2011, 68% of people were paying taxes and Ouelessebougou moved to the top ten cities in terms of transparency and economic development. Fast forward to 2014. This is the last year of Yeah’s first term as Mayor. This year, the Mayor’s office decided to do something different to acknowledge the great work that the different villages in the community of Ouelessebougou were doing to make sure that their taxes were paid on time. The Mayor’s office partnered with a local organization called PACT ( Programme d’Appui aux Collectivités Territoriales/Support Programme for Local Authorities) to publicly acknowledge and celebrate the community’s success at paying their taxes. Part of this Citizenship Day called on a public paying of taxes by all leaders of the community ( village chiefs, Mayor, Deputies, Local Chief of the Police, Chief of Customs in Ouelessebougou etc). It is said that actions speak louder than words and what better way to encourage and support tax payment than to publicly pay one’s taxes. In just one day, the city of Ouelessebougou collected over $3000 just from the community leaders. In addition, independent consultants reported a tax collection rate of 100.74 % ( the number being this high also because some people back paid their taxes from 2009). An additional surprise was the acknowlegement by the Government of Mali who sent their Mininster of Decentralization, Malick Alhoussein, to represent the government at this important event. When the Minister spoke, he publicly acknowledged Yeah’s efforts in truly practicing decentralization and turning Ouelessebougou into an example of a well managed city. He praised the efforts of the different village chiefs and also the people of Ouelessebougou for setting an example for the rest of the country. These efforts are plain to see in the development that is springing up all over Ouelessebougou. From clean running water to clean energy and from infrastructure like factories, stadium enclosures, a new high school and a new hospital, Ouelessebougou will soon become a dream city for many in Mali. And this all is possible because one man said enough was enough and then showed his people how to manage their money honestly into development. Ouelessebougou is breaking all boundaries on development and showing the rest of Mali how it should be done. I am very proud to be the First Lady of this great city! Today was another election in Mali. Today was the day when Malians would go to the polls to choose the delegates that would represent their area in the National Assembly of Mali. Many news agencies and international organizations had touted this election as sealing the long road since the country was thrown into chaos in March 2012. As many of you know, Yeah had submitted all his papers to run in the legislative election. However after his papers were approved, his old party URD lodged a complaint stating that as an elected official Yeah had to step down from his role as Mayor since he was elected under the party URD. In, what we believe to be a very corrupt ruling, the Constitutional Court invalidated Yeah’s candidacy to run for the National Assembly. What we cannot grasp is how the same Constitutional Court did not disqualify Yeah’s papers when he ran for a higher office of President. Should the same laws not have applied? Or is the law only applied when it suits certain parties and certain individuals. In addition, Yeah had officially submitted his resignation to URD’s local office in 2011. This resignation, while acknowledged by the local office, was conveniently brushed under the rug and forgotten. 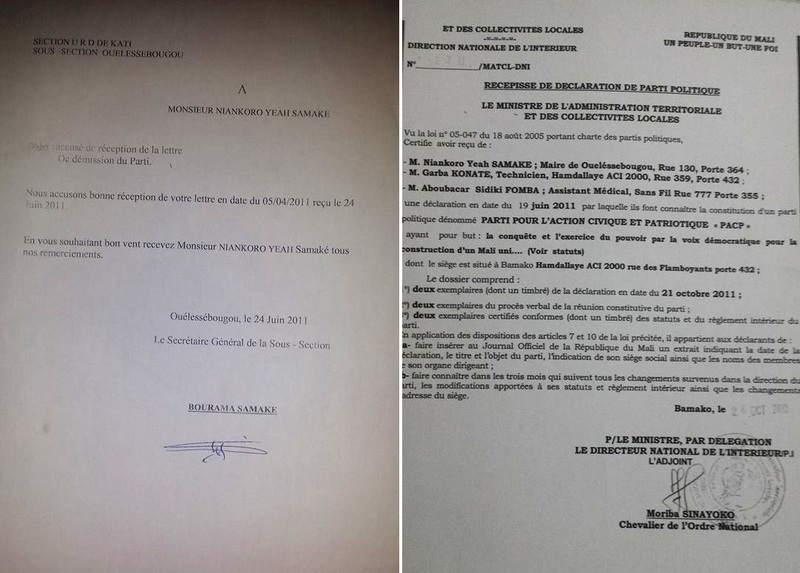 To make matters even more incomprehensible, Yeah is listed as the President of his new party on an official document provided by the Malian government. It is very sad and angering that it had to come to this. The area that Yeah was running in is his own home turf. A turf he is well known on and well respected. This area also has 7 seats at the National Assembly and has been constantly won by the party URD for the last 10 years. This was one race that they could not afford to lose. We have done all we could to fight the decision, even taking it to the EU observers and UN observers that were assigned to observe elections. It makes you realize just how powerless these individuals really are and that elections are determined not at the voting booths but in the governments and justice systems before the lists even make it to the booth. In the last few weeks, Yeah has campaigned vigorously for his other party members that are also running in different areas all over Mali. From the different communes in Bamako to Kenieba to Diola, he has supported his party members in their own areas and races. However his own area of Ouelessebougou vowed to boycott elections in the area of Kati in response to the blatant injustice of the disqualification and the inability by the Malian government and people to address/fix the mistake. 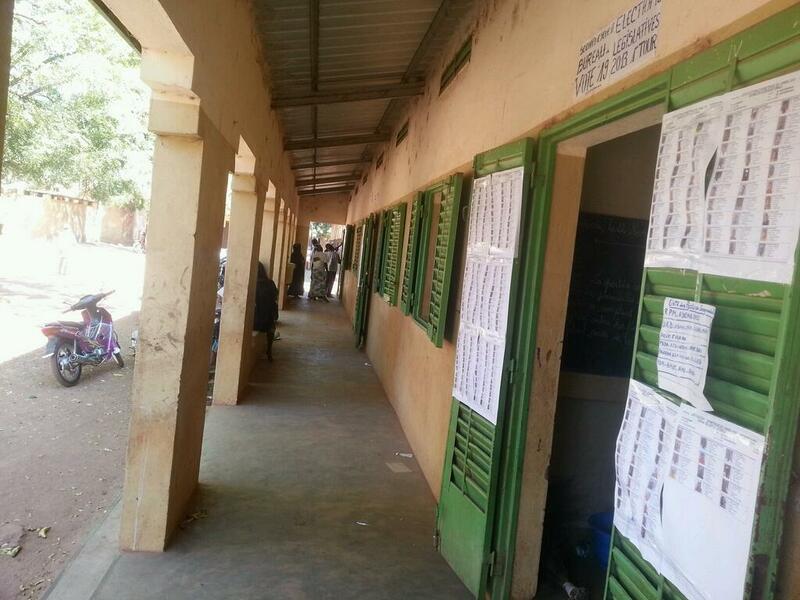 As we watched in Ouelessebougou, the voting booths seemed like ghost towns. Most polls are predicting that no more than 20% of the 6 million voting population went to the polls to choose their legislative leaders. It’s sad to watch how people have lost faith in their leaders and believe that their opinion is as forgotten as the leaders campaign promises. While news outlets are trying to make it seem like security concerns kept people away, this is not true. The number of insecure areas is so minimal compared with the majority of voting precincts through the country. The poor turnout is an indication of how people just don’t care because deep down they know nothing will change. Also there are so many candidates that the names that stick out are the ones who have ruled Mali’s political deficiencies and failures for the last 20+ years. But many will go with names they have heard rather than ones they are not familiar with. Once elected, these delegates will remain in office for 5 years. For 5 years the delegates will get richer while their areas get poorer. And the same cycle will continue until the people decide enough is enough and democracy means their voice gets heard and remembered throughout the elected term and not just in the 2 months before elections. We had run for the Presidency and then again wanted to run for the Legislative race with one purpose only, and that was to affect change. Look at Ouelessebougou. No person can say that the city has not changed dramatically for the better in the last 4 years of Yeah’s term. Nevertheless, we will not give up hope. We will continue to do the things that will improve the lives of Malians. Whether that is strengthening our political standing for a better run in 2018 or building schools, providing educational, clean water and healthcare opportunities to Malians under the foundation Empower Mali, we hope to give Mali our very best. Ouelessebougou and the surrounding communities welcomed a very special guest to their commune on March 26th, 2013. The visit was the first of its kind by a dignitary of this magnitude in this region of Mali. Given the recent circumstances in which France has extended solidarity to Mali, Yeah, in his mayoral capacity, invited the Ambassador of France to Mali, Ambassador Christian Rouyer, to see Ouelessebougou and experience the many developments ongoing in the region. Ouelessebougou already shares a sister city relationship with Pontivy in France. Through it many great projects in the areas of water and education has become a reality for Ouelessebougou. Ambassador Rouyer and the French delegation were received with great pomp as he and his delegation entered the city of Ouelessebougou. The air was thick with excitement as such an event has not seen for as long as many could remember. The people of Ouelessebougou and the surrounding villages turned out in droves to meet the French delegation. Ambassador Rouyer in his speech was very appreciative to the people that came out to welcome him so warmly. In his speech he expressed gratitude to the people of Ouelessebougou and also their leader Yeah. He has been very appreciative of the leadership role that Yeah has played since last year’s coup. Regarding the situation in Mali, he said it was France’s obligation to help Mali. For during the Second World War, it was many Malians who paid the price of freedom with their life as they fought for France. Now it was France’s turn to help Mali combat terrorists. About governance in Mali, Ambassador Rouyer bluntly stressed that “Mali is not condemned to poverty, corruption and rebellion. It’s just a question of governance. It has all the capacity and potential to remain strong among the great nations of the world. In any case”, he added, “the majority of Malians aspire to a profound change. To do this, the Malian people must take their destiny in hand through a high turnout in elections to elect men and women to meet their aspirations.” This was amazing to hear as it was a reaffirmation of what Yeah has been saying all along. Mali’s many problems come not from the lack or inability of Malians, but rather from the leadership that has failed them. Mayor Yeah Samaké then presented the Ambassador with a flag of Mali as a token of appreciation. This is the same flag that Yeah was presented with by Colonel Keba Sangare in Tombouctou last week. Colonel Sangare is a Red Beret and paratrooper commando and is the current commander over the 5th military region in the North. He had presented Yeah with the Malian flag as an appreciation for what Yeah has done for Mali. By giving the same flag to Ambassador Rouyer, Yeah was extending the military’s appreciation for the French forces now fighting on Mali’s behalf. After the speeches and an afternoon filled with cultural richness, Ambassador Rouyer and his delegation joined the dancing. Malians love music and love to dance. For Malians to see “white” people dancing is indeed unique, but also it warms their hearts, for to them it is an acceptance and embracing of the Malian culture. The visitors were not shy. They seemed to truly enjoy the Malian culture that is often hidden in the city life of Bamako. Many of these diplomats will not venture past the main cities because their duties usually keep them in these areas. The evening ended on a high note as Yeah led the delegation to look at all the development projects and achievements Ouelessebougou enjoys today. Ouelessebougou enjoys the spot as one of the top 5 cities in terms of development and management. Many people in Ouelessebougou have not been as affected by the economic crisis in Mali as other villages and cities. This is apparent in the level of development projects present and the life style of the people of Ouelessebougou. As they toured the solar panel field, high school, the hospital and water tank, there was great, genuine, appreciation for how far Ouelessebougou has progressed in comparison to other areas. The date that this took place is also a memorable date for Malians. March 26th marks the anniversary of the martyrs that lost their lives for democracy in Mali. On March 26th, 1991, after days of fighting, displeasure over the military dictator Moussa Traore’s government reached its peak. Many university students especially lost their lives as riots seized the streets of Bamako. I remember Yeah telling me, that back in those days, he was a student at ENSUP. He remembers going to join the movement against the dictator. However with the death toll mounting, his father came all the way to Bamako and pleaded with him not to join. Soon, the army lead by Lieutenant-colonel Amadou Toumani Touré (the same President who was overthrown last year), refused to fight the civilians and instead with a team of 18 other soldiers they arrested and overthrew President Moussa Traore. Malians have long celebrated those that gave their lives for the democracy movement. This year, this day holds more significance for it is a caution that those deaths should not continue to be in vain. That the democracy that they fought for should not be forgotten and that Mali must return to a government where the people are represented. Ambassador Rouyer expressed his genuine gratitude for this memorable event. It comes at a time, when his tour of duty in Mali comes to an end. A Sarkozy appointee, he will return to France soon and he will be replaced by Gilles Huberson. He has been an outspoken advocate for the French military intervention and had been posted in Mali since 2011 and had cautioned about rebels in the North long before they took over. This is a memorable event for Ouelessebougou as well. It comes at a time when Ouelessebougou is enjoying its own successes and growth. It is hoped this event will only bring more development opportunities to Ouelessebougou and the surrounding communities. It is at times like this, that I pray that people will see the great work that Yeah does. Yeah doesn’t do it because he will personally gain. The successes of his people and his community are paramount to any political ambitions. However we realize that it is only through our political ambitions that we can spread the successes of Ouelessebougou to all of Mali. I have read comments that try to downplay Yeah’s popularity. I would urge all these naysayers to actually venture past the walls of Bamako and gain a true perspective of the 80% population and what they say about Yeah Samaké. What Mali needs is a leader that is trustworthy and dependable. A leader that will guide Mali to greatness and Malians to a better standard of living. A leader that has actually done something for his community and given rather than taken away from Mali. This all is possible. Two words: YEAH SAMAKE.